Una cachetada. A slap in the face. That’s what made Ozzie Godinez walk away from his lucrative position at one of Chicago’s leading ad agencies. The slap was a figurative one: One he felt every day when he sat down to work on a trite and one-dimensional Hispanic ad campaign. One that stung every time an account director told him to include mariachi music, a grandmother, a bull fight, or a telenovela. Godinez’s frustration was so strong that he left the agency without waiting to line up another job. Across town, his friend Pablo Acosta was dealing with similar emotions. Acosta, who came to Chicago from Peru, was growing weary of designing ads for Latinos in a room full of non-Latinos. The two friends commiserated at the Green Door Tavern, uttering phrases such as “there has to be a better way” and “the Hispanic market deserves so much more.” They talked about a different kind of agency: One where they would both want to work. One that would create nuanced, authentic ads. One that would value and leverage diversity. One that would help clients by standing in stark contrast as a clear alternative to the old and ineffective way of reaching Latinos. 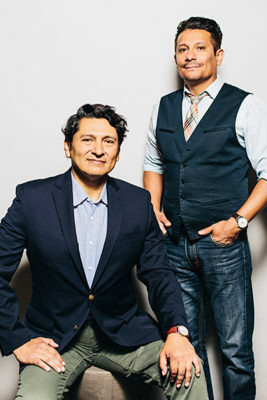 The conversation reached a fever pitch, and soon, Godinez and Acosta were scribbling a mission statement—their battle cry—on a cocktail napkin. It was then that they realized something. Godinez had learned the business side of the industry. Acosta was more of the traditional agency creative type. Together, they could do something special. That night, in one of Chicago’s oldest bars, the city’s newest ad agency was born. The new cofounders decided that Godinez, the marketing expert, would become CEO. Acosta, the creative mind, would be the company’s chief creative officer. But what would they call themselves? After rejecting a few awkward combinations of their first names, last names, and initials, they settled on PACO—a common nickname that evokes and represents the average, everyday Latino. “Everyone knows a Paco, and he’s always cool,” Godinez says. With that detail settled, the hard work began. “We were too naive to realize that we could fail,” Godinez says. “We had no business succeeding.” They didn’t know how to incorporate. They didn’t know how to find a lawyer. They didn’t have a projector for client meetings. They didn’t even have clients. All Godinez and Acosta had was a stack of business cards, a borrowed laptop, a few hundred dollars in the bank, some relationships, and endless amounts of determination. It was April 2006. The spring and summer came and went, and PACO still hadn’t landed its first client. Acosta and Godinez met often to work their contacts and discuss strategy. To save money on meals, Godinez made simple chilaquiles. Every day. Finally, in the fall, PACO received a lifeline. The fledgling agency landed a meeting with Harris Bank (now BMO Harris). They crammed for the meeting, borrowed a projector from a local pastor, and won the job. Tampico followed soon after, and although PACO’s work for the juice drink was for a local campaign, the beverage company used it worldwide. When the small team started winning more clients on retainer, Acosta and Godinez set their sights on expansion. They opened an office. They hired additional staff. And they bought a projector. Immigration was down. The Hispanic market was shifting from Spanish to bicultural to English dominant. The transformation led PACO’s leaders to pivot and become a cross-cultural marketing agency—one that aims to reach all ethnicities and cultures through a “bottom-up” approach. In 2015, what started as PACO became PACO Collective. To start, PACO adapted general marketing insights for a Spanish-speaking audience in authentic and culturally sensitive ways. Today, PACO Collective uses its own proprietary research and insights from its diverse team to create stories with universal themes that reach various demographics. The original PACO started working with ComEd in 2011, when Godinez and Acosta created content aimed at the utility’s Latino customers. Now, the rebranded PACO Collective has taken the partnership further by helping ComEd connect with users across ethnic and cultural divides. In 2015, PACO Collective delivered marketing materials to support ComEd’s home-savings initiatives. Acosta oversaw his creative team’s development of computer-animated appliance characters that forged an authentic and emotional connection with ComEd’s users. The spot won PACO Collective a gold ADDY at the American Advertising Awards ceremony in March 2017. A decade after setting out to create the kind of agency where they would want to work, PACO Collective’s cofounders are living their dream. Now, they’re dedicated to ensuring their workplace attracts and retains top talent. “I rely on the expertise of each team member hired at PACO and want to reward them with culture, growth opportunities, and, most importantly, the chance to be a part of something special,” Godinez says. Today, PACO Collective is growing faster than ever before. Most recently, it was ranked twenty-eighth on Crain’s Chicago Business’s Fast 50, a list of the best and most-innovative companies in the Chicagoland area. The agency is clearing space in its Greektown office for the numerous industry awards that keep coming in as it adds to an already impressive list of clients, including the Illinois Lottery, Blue Cross Blue Shield, the Chicago White Sox, the Chicago Bears, and Discover. And, while the hard days may be behind them, the cofounders are determined to remember their roots. Each year, on the anniversary of Godinez and Acosta’s meeting at the Green Door Tavern, PACO Collective employees gather for an anniversary celebration—and a plate of chilaquiles.